I’m in Melbourne, and as a true Sydney-sider I’m lost. I’m lost and I’ve been walking for miles trying to find this place. After a 2 mile walk I finally found it, The Brunswick Cider House, now I’m thirsty and now I’ve found what I’ve been hunting. Too Too Many Chiefs Pear and Apple Cider. 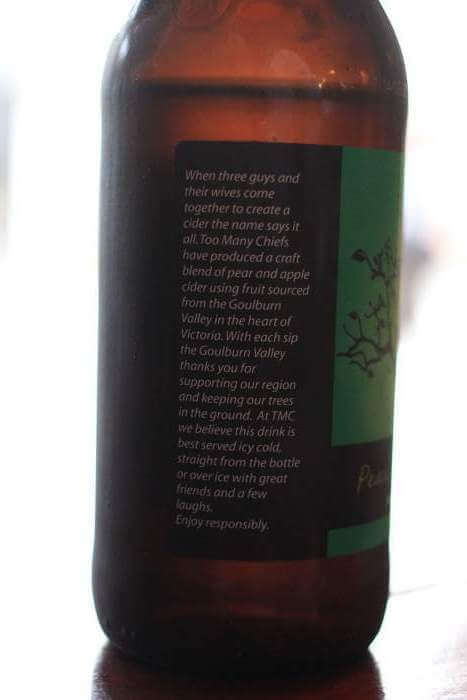 3 husbands and 3 wives from Goulburn Valley teamed up to create a pear and apple cider with the honorable intention of supporting local orchardist. They say this helps keep the trees in the ground. There are so many reasons why this is import. From the many environmental reasons to the economic reasons. Many other craft cider makers also support this cause, but Too Many Chef has to be thanked for putting it on the bottle and bringing it to our attention. Think Global Act Local. This ticks all the quality boxes, no added, sugar no concentrate, no rubbish. The saying goes Too Many Chiefs not enough Indians. That’s not the case here. The extend family of 6 have made an easy to drink sweet pear cider. Fresh and tasty perfect for sharing or over ice. You could do a lot worse asking for a sweet cider like the Too Many Chiefs Pear and Apple Cider at most pubs.